2007 Ringin' Ten Scratch Classic! Ringin’ 10 tournament director Terry Martin, left, presents the championship trophy to Butte’s Nate Gelling on Sunday at Star Lanes Family Sports Center. Gelling defeated Spokane’s Mike Hanson 197-194 in the championship match to claim his first ever Ringin’ 10 victory. Phenom, a funny nickname that has followed Nate Gelling since he started busting through the stratosphere as a YABA bowling star and has stuck ever since. On Sunday, he proved why the phrase will be uttered for years to come. At the ripe old age of 23, Gelling won the prestigious Ringin’ 10 classic at Star Lanes in Butte by edging out Spokane’s Mike Hanson 197-194 in the championship match. In just his seventh try, Gelling recorded his first Ringin’ 10 title and the first hometown boy to win since Mark Hodges in 2001 and former Butte resident Troy Hanninen in 2002. Before the title match, Gelling outlasted pesky Craig Harrington 225-196 for a rematch of the position round loss to Hanson 258-225. 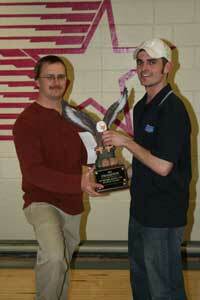 On the way to the trophy, Gelling qualified first on Saturday with a 256.33 average for six games. After Sunday’s 12 games of match play, one position round game and two games in the step ladder, Gelling still torched all 166 entrants with a dominant 223 average on brutal conditions. In the championship match, Gelling was down by nine pins heading into the tenth frame with Hanson bowling for the title. His ball drifted high on the head pin leaving the 6-7 split. Hanson chopped the six, leaving the door open for Gelling. The open frame meant Gelling had to mark and get eight pins on his fill ball. His first ball drifted too high, but left the manageable 6-10 spare which he converted. Gelling then fittingly buried his final ball, sealing the 3-pin victory. And just how competitive has this tournament become, you ask? Tournament director Terry Martin said that of the 166 entries, the extremely high cut line of 108-over — an average of 218.00 — was the highest in tournament history. Martin also said that bowlers trekked to Butte from all directions, including Edmonton, Canada; Beaverton, Oregon; Reno, Nevada; and Minot, North Dakota. There were 14 Montana bowlers that made the cut, including 10 from Butte, Anaconda and Dillon combined. Along with Gelling, Dave Martinich Sr., Jim McKenzie, Dave A. Martinich, Jack Hocking, Keith Meagor, Dustin Mantha — now residing in Reno, Nevada — and Mark Hodges qualified from Butte, J.J. Potvin qualified from Anaconda and Brad Cottom made the cut from Dillon. Gelling’s 798 was the highest 3-game series of the weekend and Draper, Utah’s Craig Harrington’s 300 was the high game. 48, Mark Hodges, Butte 218.00. Nate Gelling, Butte def. Harrington 225-196. Gelling def. Mike Hanson, Spokane, WA 197-194.